ProTexting.com had the wonderful opportunity to be a technology partner for the G8 Young Summit that took place in Washington D.C. from May 4—6, 2012. The G8 Young Summit is a gathering of 100 delegates from 20 countries. These young leaders of tomorrow spent 72 hours doing intensive work encompassing Global Dialogues, Global Panels and Global Think-Tanks, which led to recommendations that were presented in the form of a final communiqué and a call to action for the world’s leaders who met the following week. The G8 Young Summit takes place before the G8 Annual Meeting that convenes with the Heads of State from all participating countries. 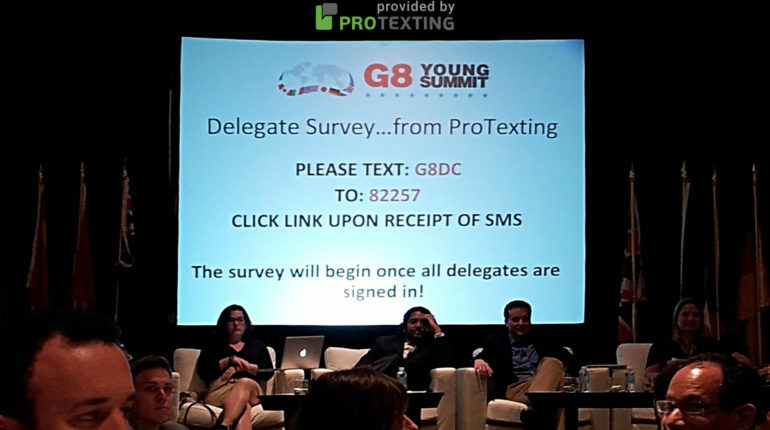 How exactly did ProTexting work with the G8 Young Summit? 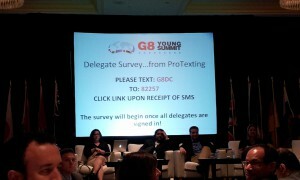 The ProTexting.com mobile platform was used during the survey and voting process. The delegates discussed many Global issues, including the Economy, Health, Security, and Governance. Additional presentations and discussion covered topics such as Genocide in Africa and Nuclear Proliferation. After many hours of discussion and deliberation, delegates voted on issues and then ranked the top five. Among the top five issues, they voted to choose the number one issue that they will work on together to find a solution. In prior years, the Summit conducted their voting process by using a traditional paper and hand-tabulation method. The process was tedious and did not get the full participation of the delegates. It took too much time to sort results and to verify accuracy. During the summit, American diplomat John Negroponte spoke about the sheer speed of information transfer today vs. the way it was during the past 20 years. It’s obvious how times have changed and how our ability to communicate rapidly has changed not only the way we do business, but it also has forever changed the world. Increased speed and efficiency of the voting process. Increased delegate participation in the voting process. Ensure the accuracy and integrity of the data being tabulated. Ensure every delegate’s mobile device could participate. Tomorrow, let’s see if G8 Summit met its goals by using our mobile voting platform. – Kalin J.